They say a butterfly flapping its wings can affect the course of a hurricane halfway across the globe, but in California, some bridge contractors have witnessed firsthand the major consequences of an even smaller creature: A baby hummingbird still in its egg. A project to renovate the Richmond-San Rafael Bridge, just north of San Francisco, came to a halt Tuesday (Jan. 31), when an Anna’s hummingbird nest with an egg in it was discovered in a tree that was set to be cut down as part of the job. While not particularly uncommon in California, that particular type of hummingbird is protected under the Migratory Bird Treaty Act, which prohibits its hunting or removal. Crews must delay the destruction of the tree until the little bird leaves the nest, which could take weeks. 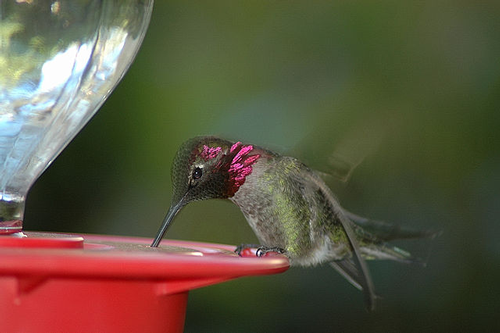 The Anna's hummingbird is protected by the Migratory Bird Treaty Act. That doesn’t mean a wholesale shutdown of the project, of course. A Metropolitan Transportation Commission representative told the Los Angeles Times that crews will work on other jobs until the bird goes on its way.